"I encourage you to explore whether your driving actually matches up with your perception." In order to instill deeper habits that translate to improved performance over time, we turn to video (and data), to uncover habits, strengths, and weaknesses that sit beneath the surface of the mistakes we observe on track. Being able to fix mistakes as they happen on track maximizes our performance on that day. But in order to understand the root cause of our mistakes and instill better long term habits, video and data are invaluable tools. This post will focus only on video analysis. While usage of data analysis tools is growing quickly, video is ubiquitous at this point. We will revisit data analysis in a future post or video tutorial, likely in the form of a collaboration with an expert in that area. Having the ability to watch our hands functions as our steering wheel position sensor. The sound of the engine functions as our rudimentary throttle position sensor. Being able to clearly see the position and attitude of the car functions as our speed and position sensor. We can identify execution errors by comparing our run to our visualized game plan. With analyzing video, we can take that idea further and identify the root cause of the errors we make. You do not need any fancy/expensive software to do any of this. iMovie on a Mac, or Windows Movie Maker on a PC will do the job just fine, though there are specialty editors like Race Render which offer great features for less than $50. Start out with watching the video in slow motion, paying close attention to notice a moment where we deviate from our game plan (i.e. we made a mistake). We then back up from this point and advance the video manually frame by frame to try to identify what caused that error to occur. For example, let’s say our error was that we entered a corner a bit too fast and pushed wide as a result. There could be multiple reasons for that error. It could be that we did not brake at the right time, or did not brake with the right pressure, or that our approach angle was wrong, or that the car was unbalanced and out of shape prior to corner entry, and so on. With autocross, the root cause analysis can get even more complex because the elements are so close together. It could be that a slight mistake in a preceding element is what causes a larger mistake in the subsequent one. If we only take note that we entered the corner too fast, and don’t look deeper to understand the real cause, we would be missing the opportunity to find a specific problem to correct. Even worse, we may end up with the wrong conclusion! For example, imagine that we identify 3 places on the course where we made mistakes on corner entry. By not digging deeper, we may incorrectly conclude that we need to slow down more on corner entry. Perhaps the real problem was that each of those 3 corner entries came right after transitional elements, and that the car was at the wrong angle or attitude when exiting those elements. As a result, we may end up unnecessarily slowing down on corner entry, when the real solution would be to position the car better at the exit of transitions. There are innumerable examples like this. What may seem like an on-throttle oversteer mistake may have actually began as a mid corner lift-throttle problem. What may seem like an ill handling car may not be a problem at all, but rather be caused by what we are doing with the steering and pedals. KEY LEARNING: The problem may not be where we notice the symptom. This is why after noticing a mistake it is critical to go back and review the preceding moments frame by frame to see what may have caused it. Repeat this kind of analysis over the course of the entire lap, noticing where we made a mistake, and then going back to identify the real cause. In doing this type of root cause analysis, we give ourselves a much more refined set of problems to work on. I strongly recommend taking notes and keeping track of the types of mistakes we make. This doesn’t need to be anything more sophisticated than a spreadsheet, or even just a notepad. By keeping track of the types of mistakes we make, we can start to notice patterns over time, which can help us prioritize what is most important for us to work on. TAKE ACTION: Create a spreadsheet or a text document or whatever you are comfortable using, and start documenting the types of errors you find in your driving. Remember, to dig deep enough to identify the root cause. Document the root cause (such as exiting transitions improperly), the problem it caused (blown corner entry), what you may have been doing with the steering and pedals, etc. Doing so will help you identify particular aspects of your driving, situations, or types of corners you need to work on. Remember to utilize all the channels of information we get from video; what we are doing with the steering wheel, what we are doing with the gas and brake pedals (you may be able to directly see this, or go by sound), and the position and attitude of the car. Use all these channels of information to identify execution errors as well as game plan errors. While analyzing a single video reveals many insights and learning opportunities, it is difficult to quantify the amount of time lost with each mistake. This is where comparative analysis helps, in the form of side by side videos (iMovie, Windows Movie Maker, Race Render, etc., all have this capability). It is best if you have someone else’s video to compare to. This could be video from the winner, a close competitor, or a codriver. Even if none of those are available, there is insight to be gained from comparing against a different lap of our own. We will be spending most of our time moving the videos around and measuring time within the video editor itself; we are less interested in rendering the composite video. If your video editor allows, I recommend panning the audio for one video completely to the left, and the other completely to the right. This allows us to hear the differences in throttle usage very clearly! 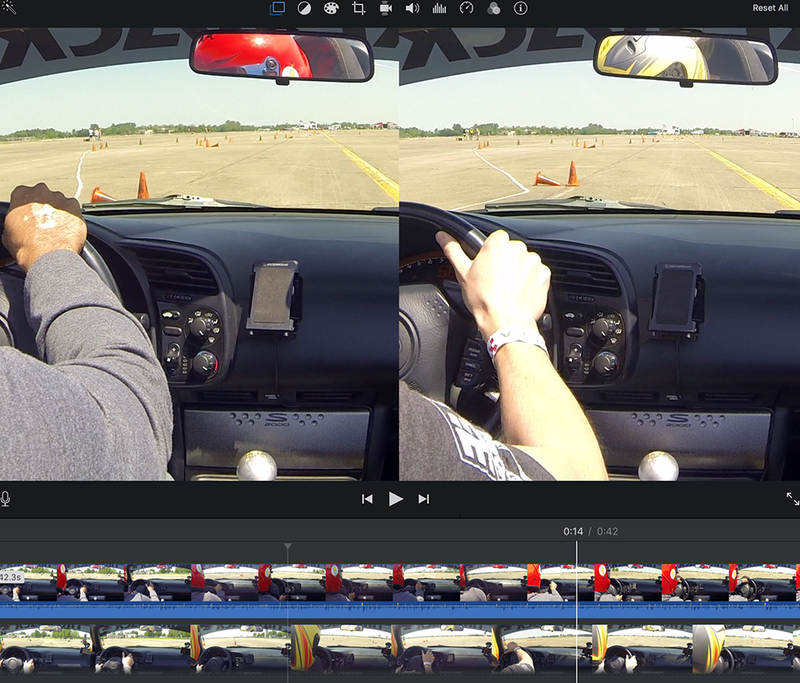 Start by syncing the two videos such that the cars cross the start lights together. From there, manually “roll” forward through the videos and observe the differences between them. It’s best to do this in small sections (1-2 corners or elements) at a time. The moment you notice that one driver has gotten ahead of the other in terms of position, back up and identify what was done differently. For example, let’s say that the 2 drivers approached a 5-cone slalom at the exact same time, but driver #1 reached the end of the slalom before driver #2. Back up to the section prior to the start of the slalom and notice what, if anything, the drivers did differently. Remember, pay attention to steering, throttle usage, vehicle position, and yaw. Even if they approached the start of the slalom at the same time, there could be differences to observe: Did driver #2 have a poorer entry angle? Or scrub some speed off at the slalom entry that wasn’t necessary? Advance through the slalom frame by frame and try to see if the delta grows linearly, or if there was a larger singular mistake made that cost all the time. Depending on the video editor you are using, quantifying the time lost may be as simple as looking at the timestamp where driver #1 crosses the last slalom cone and then the timestamp where driver #2 crosses that cone, or may require clicking and dragging on the second video to select the appropriate range to determine the time delta. As you proceed to analyze the next segment, sync the videos again such that the cars are lined up with no delta for the new segment. However, keep in mind that benefits from the previous segment may cause mistakes in the next. For example, imagine a slalom leading directly into a sweeper entry. Imagine that driver #1 exited the slalom really fast but ended up poorly positioned for the sweeper entry, and driver #2 was more conservative through the slalom in order to be better positioned for the sweeper entry. Let’s say driver #1 gained 3 tenths in the slalom, but then lost 2 tenths because of the poor sweeper entry, and thus ended up 1 tenth ahead after the sweeper. Take care to not mistakenly conclude that driver #1 could hypothetically fix that corner entry while keeping everything else the same and enjoy a 3 tenth advantage. It is important to recognize that 2 tenths were lost at sweeper entry because of the driving choices that created the 3 tenths gain in the slalom, and that in order to fix the sweeper entry, the driver will have to compromise the slalom to some degree. TAKE ACTION: When comparing against other drivers in the same car as you, do you notice particular types of elements, corners, or situations where you lose/gain time? When comparing against other drivers in different cars, do you notice strengths/weaknesses of each car? When comparing against other laps of your own, are you seeing the same mistakes consistently, or different ones on each run? Apart from aiding with deeper learning about our mistakes, analyzing video can be a very revealing exercise because our recollection of events are often flawed. We have all had numerous instances where we could have sworn we stayed “flat” on the gas through a tricky section, only to later discover that we weren’t quite as bold as we thought we had been. This is also evident in our recollection of spins, where we often remember them as sudden and unexplainable incidents, only to later discover (on video) the exact mistakes we made that caused our spin. More broadly, most of us associate ourselves with certain styles or attributes; we may think we get on the gas early, or we may think we trail brake a lot, we may think we are strong in transitions, or weak in sweepers, etc. I encourage you to explore whether your driving actually matches up with your perception.